​After a pair of American robot makers challenged their rivals in Japan to a mega duel involving their mechanical creations, the corresponding team in Japan has responded without hesitation: ‘Bring it on’. 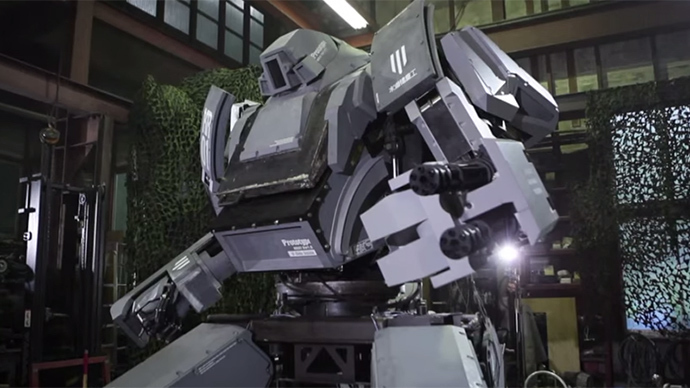 In a video posted on YouTube, Kogoro Kurata, the CEO and founder of Suidobashi Heavy Industry, said his company would be more than willing to battle US-based MegaBots in an epic robot faceoff. "Yeah, I'll fight. Absolutely,” Kurata said in the video. The idea for the battle originated in late June, when MegaBots published a YouTube video calling on Suidobashi to fight its 15-foot tall Mark II robot, which the company called “America’s first fully functional giant piloted robot.” The gasoline-powered robot weighs in at 12,000 pounds and requires two pilots to operate it. It also shoots large paint cannonballs at over 100 miles per hour, has twin gatling guns and moves around via tank treads. Noting that Suidobashi built its own pilot-operated robot well beforehand known as the Kuratas – named after Kurata himself, the robot has been operational since 2012 – the MegaBots founders suggested what every young 12-year-old wants to see when realizing two giant robots exist in the world. While Kurata is more than obliged to take on his American challengers, he did tweak his opponents for the way they boasted about some of the Mark II’s features. Instead, Kurata proposed something much more dynamic than just watching two giant hunks of metal stand there and shoot guns at each other. He wants to see the robots fight melee-style, throwing punches and performing other physical maneuvers. “If we’re gonna win this, I want to punch them and scrap them down to do it,” Kurata said in the video. The Kuratas isn’t quite as tall as the Mark II, but at 12 feet in height and 9,000 pounds in weight it’s still a remarkable looking machine. Requiring one person to operate, the Kuratas moves around on a set of four wheeled legs, can shoot bottle rockets and features BB gatling guns that are controlled by the pilot’s smile (yes, you read that correctly). In a separate video, Suidobashi even depicted the Kuratas driving through Tokyo’s Shibuya Crossing. Both the US and Japanese teams will need to make modifications to their robots before any fight, which has been set for about one year from now. There are no other details on a time and place for the potential contest, but Kuratas said he knows how important a victory for Japan would be. "We can't let another country win this,” he said. “Giant robots are Japanese culture."